Finding a great math program is important and such a relief! We use 2 different curriculums depending on my child's grade. My kiddos that are in grades preschool through grade 2 use the ABEKA math program. We love how thorough and challenging this is. It includes speed drills, answer keys, a student text, and tests for the school year. My 1st grader is doing the ABEKA Academy Grade 1 this year so she has 2 math classes each day: Arithmetic and Combination Practice. We are using the DVD rental option and it has been fantastic! 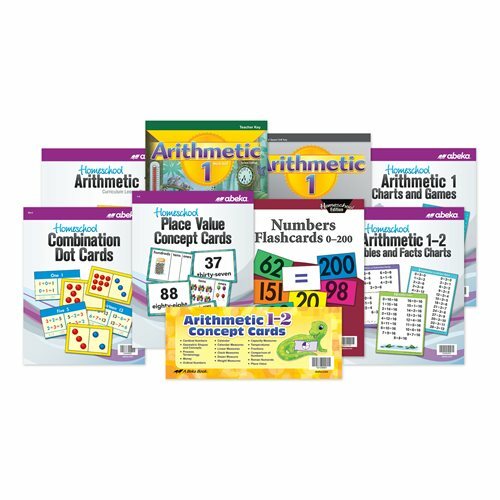 ​Abeka also has amazing teaching aids and flashcards to enhance your Arithmetic classroom. My kids that are grade 3 up through high school enjoy using Teaching Textbooks. We love the CD version for the ease and freedom it gives our family. My kids are able to work independently and also see their progress with the automated grading option. Check out my blog for more information on this wonderful CD program that you can do at home!